Flamenco is one of the better Ballerina style apples for eating fresh, however it is grown primarily for its unique ornamental value. The tree grows as single columnar stem with no side-branches, and the apples are borne on short spurs the length of the stem, creating an interesting pole-like effect. 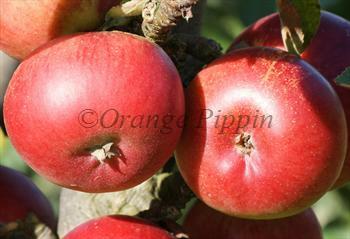 Flamenco has white apple blossom in spring and dark red apples late in the autumn. Ballerina Flamenco® is a protected variety. Please fill in the details below and we will let you know when Ballerina Flamenco apple trees are back in stock. One of the best-flavoured Ballerina minarette-type apple varieties. Ballerina Flamenco is in flowering group 3. Ballerina Flamenco is self-sterile and needs to be pollinated by another tree of a different variety nearby. Since it flowers in the middle of the blossom season it can be pollinated by most other apple trees. Flamenco should reach a maximum height of about 3m / 10ft after 5 years or so - often a bit less. There is no need to stake the tree unless you have very sandy soil or a windy situation. No pruning is usually necessary, but if a longer side-shoot starts to develop just remove it. After 5 years or so you can also thin out some of the fruiting spurs if they appear to be becoming congested. When planting this variety as a 1-year bare-root tree, do not prune back the stem (contrary to what is suggested in our main planting instructions). Flamenco can also be grown in a large patio container. Developed from a variety called McIntosh Wijcik, a natural columnar mutation of the well-known Canadian McIntosh apple variety, crossed with Court Pendu Plat and Cox's Orange Pippin. Flamenco is also sometimes known as Obelisk.